Oh yes, that Blueberry "Satan" model fits well here! Also "a bit over the top" what Martin created for NAMM 2019. 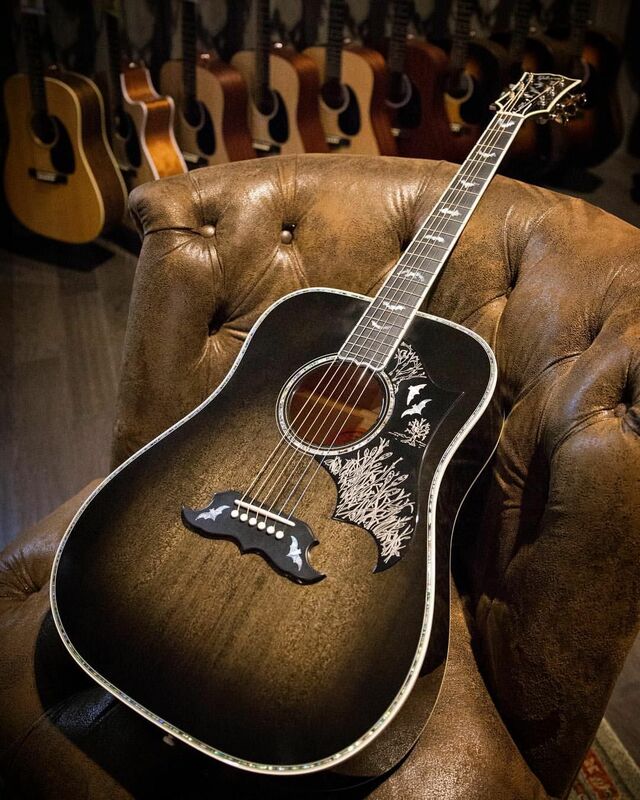 "The CF Martin D-45 Excalibur is the latest design collaboration with renowned inlay artist Harvey Leach. This special edition guitar is adorned with original artwork in honor of the mythical dragon told to have hidden the mystical Excalibur sword in its tail. The custom inlay features a dragon intertwined around both a custom rosette and a custom back purfling. The model features an Engelmann spruce top with heavy bearclaw, Madagascar rosewood back and sides, European flamed maple body binding and birdseye maple headplate binding. The tuners are Gold GrandTune open gear, and the label is signed by Chris Martin and Harvey Leach. This model is limited to 20 instruments, so visit your authorized Martin dealer to get your hands on one of these rare beauties. This model is strung with Authentic Acoustic strings. 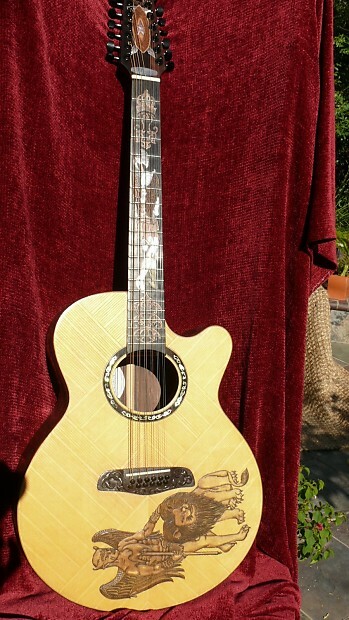 List price $39,999"
"Martin celebrates famed American-style tattoo pioneer, and Sailor Jerry Spiced Rum’s namesake, Norman “Sailor Jerry” Collins in this special edition Dreadnought guitar. It features elements of Collins’s work, titled “True Love,” inlaid with shell and hand-selected wood species on the headplate, fingerboard, and body. The artwork takes shape in a multitude of rich, earthy colors using a combination of pearl and natural wood tones. The wood tones are enhanced using a technique called sand shading. The level of artistic talent that went into creating this fine guitar is immediately evident and timeless. 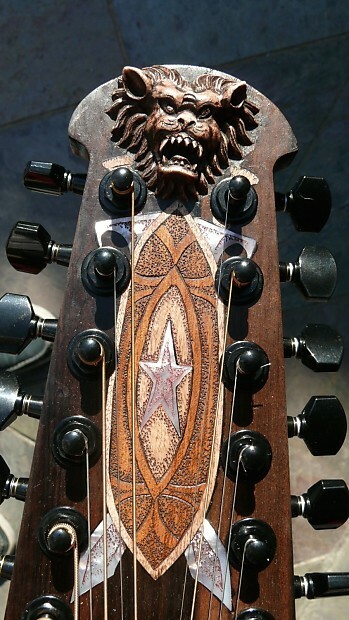 In addition to the custom artwork, this guitar features figured East Indian rosewood back and sides with flamed koa binding and a custom inlaid East Indian rosewood headplate. The top is heavy bearclaw Sitka spruce and features non-scalloped, forward-shifted X-bracing found in Martin’s recently reimagined standard series. This model is strung with Authentic Acoustic strings. List price $19,999"
Last edited by SFIV1967; 01-26-2019 at 06:24 PM. It’d be nice if they did a little more handwork on the frets and nuts, both of which are suckish; at least on their lower end US offerings. He lost me at the very beginning getting excited about how great Gibson guitars were "now" (2012). "Gibson's back, baby!". I hope they do come back, but they sure weren't in 2012. +1. See my comment above. That guitar would have great for Keith to play on the "Their Satanic Majesties Request" album.